WASHINGTON (Hurriyet Daily News)—The United States has called on Turkey to respect and ensure essential freedoms over concerns on human rights issues and freedoms in the country. “We urge Turkey to respect and ensure freedom of expression, fair trial guarantees, judicial independence, and other essential freedoms. 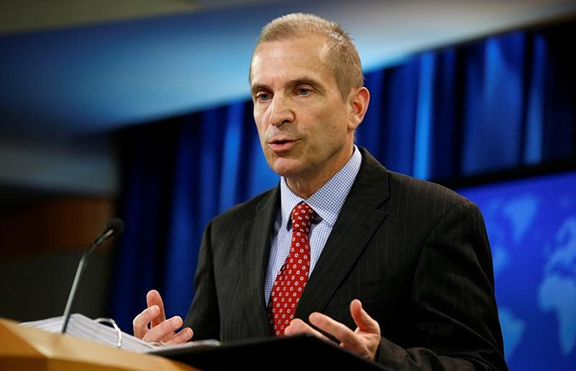 We also firmly believe in freedom of expression, and that any freedom of expression, including for speech and the media – and that includes also speech that some may find controversial or uncomfortable – only strengthens a democracy and it needs to be protected,” U.S. State Department spokesperson Mark Toner said March 16 in response to a question on an editorial by The Washington Post titled “Will the United States speak out against Turkey’s spiral downward?” and the arrest of over 150 journalists in the country. Regarding Turkey’s upcoming referendum on constitutional amendments in April, Toner reiterated Washington’s stance, saying it was only for Turkish people to debate and decide on the changes. “With respect to the constitutional referendum, I’ve said this before, I’ll say it again: This is a matter for the Turkish people to debate and decide,” he said. Turkey suffered the largest decline in terms of freedoms among 195 countries over the past year, according to an annual report published by the Washington-based Freedom House in January. The Istanbul-based Platform for Independent Journalism (P24), meanwhile, puts the number of journalists currently in prison in the country at 155 as of March 10. The country is heading to a referendum on April 16 on the 18-article constitutional amendments, including a shift from the current parliamentary system to an executive presidency. Turkey to Respect, Ensure Fundamental Freedoms, …… Mark Toner is funny, doe’s he believe what he’s saying? YOU MIGHT AS WELL BE TALKING TO A STONE WALL.THE jerks,ARE NOT GOING TO CHANGE,FROM THEIR mongolian WAYS. THEY ACT UNCIVILIZED,WHEN THEY USED LIVE,UNDER TENTS WITH THEIR ANIMALS,WITH ALL THE DEFECTATION,THE SMELL THAT REMAINS TODAY.